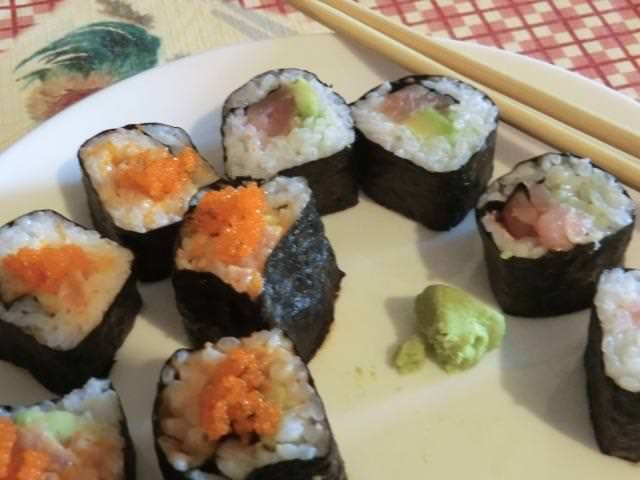 sushi | Cooking is Fun … Really!! 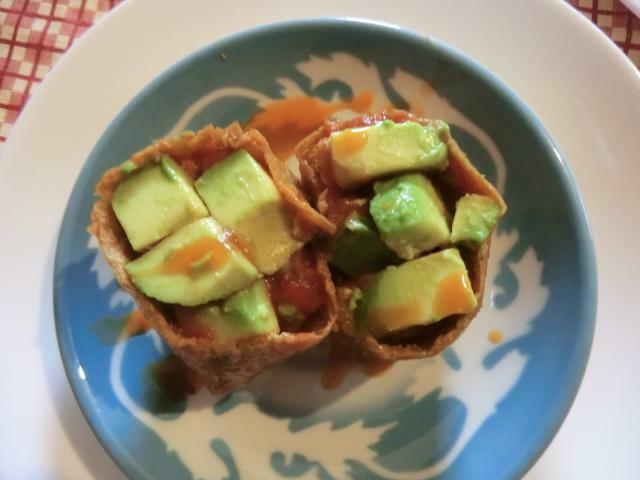 Sadly, I’ve never been to Japan, so my only exposure to Japanese cuisine has been through television programs, cookbooks and, more recently, YouTube videos. 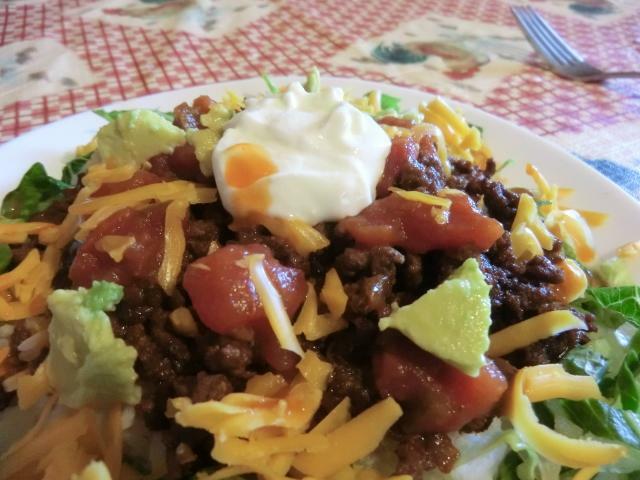 I first ran across this Tex-Mex/Japanese fusion dish originating in Okinawa on the channel TabiEats and copied the recipe from there. 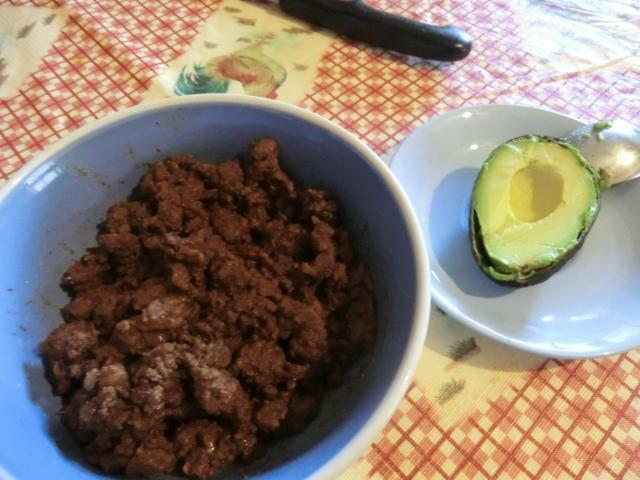 It’s a simple idea … a basic taco meat recipe, with the addition of some soy sauce to give it that Japanese touch. 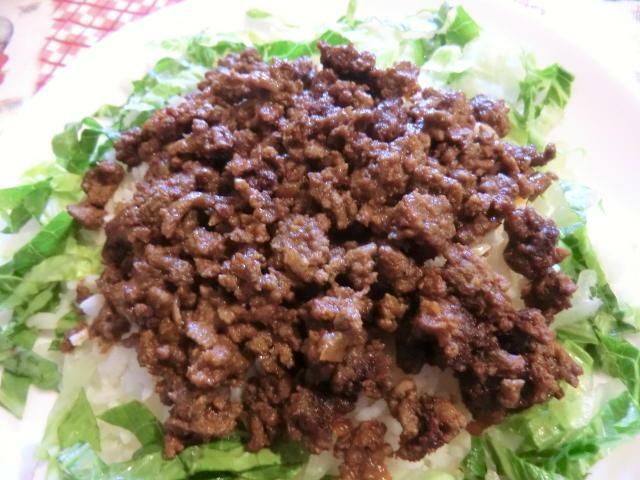 Instead of being served in a soft or crunchy taco shell, the meat is served over a cup of steamed rice. 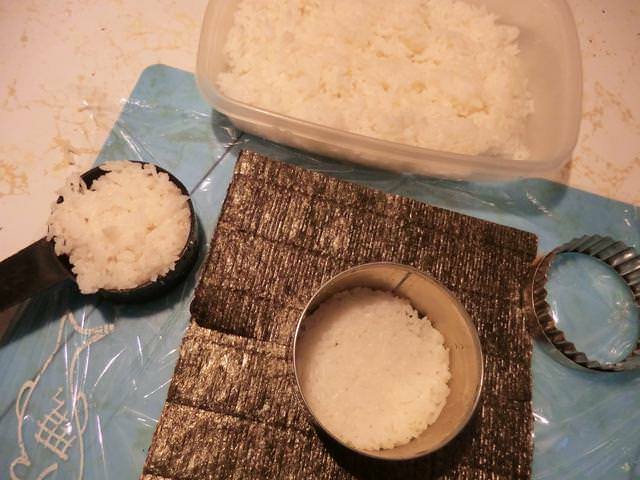 You can use short grain sushi rice or long grain, like the basmati rice that I accidentally pulled out of the fridge. Mise en place: Lean ground beef, onion, garlic, cumin, chili powder, soy sauce, tomato paste, cooked rice, salsa and salt (not pictured). 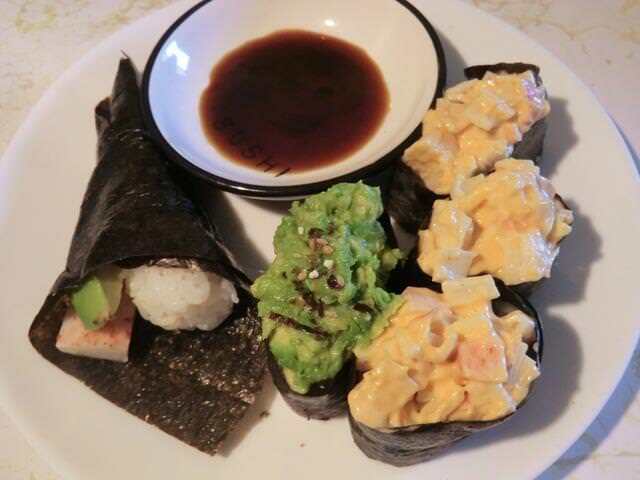 Avocado and firm tofu are for the variations. 2. 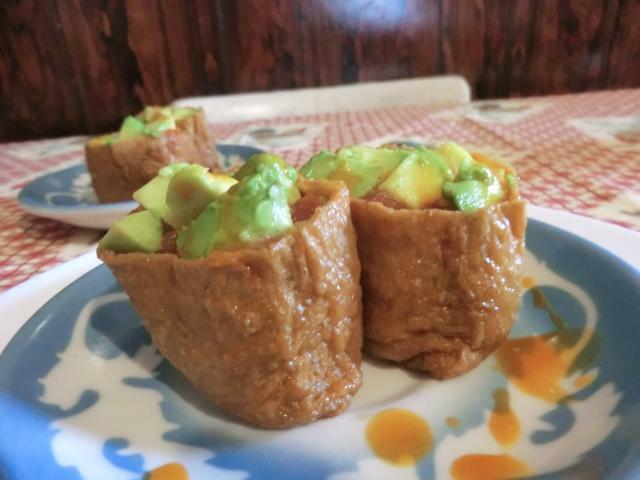 Tofu taco rice – Crumbled firm tofu replaces the ground meat (beef, beef and pork, chicken or turkey) in the taco meat recipe and is combined with the sushi rice … may be eaten stuffed in inari pouches or in endive cups. 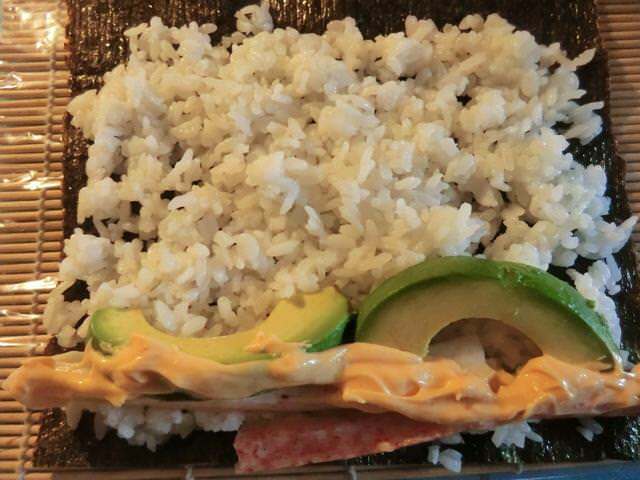 * The cornstarch adds extra body to the omelette so that it can be used as a wrap for beggar’s purses and shell-shaped sushi. 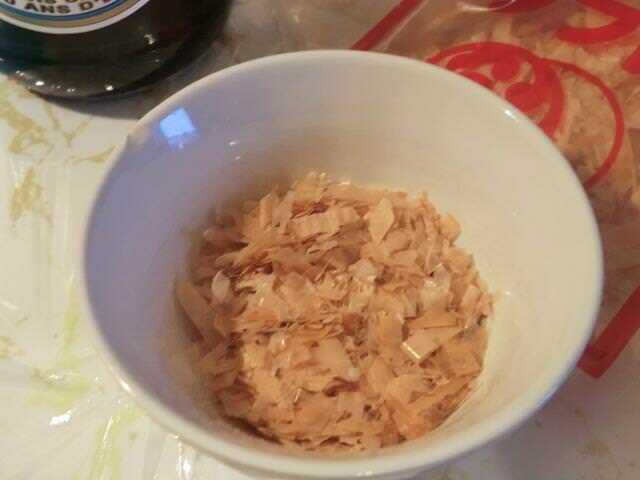 Beat eggs and water together in a small bowl. Add the sugar and salt and stir until the sugar and salt are dissolved. Place a cast iron or non-stick frying pan over medium-low heat and when heated, wipe the surface with a paper towel that has been dipped into a bit of vegetable oil. 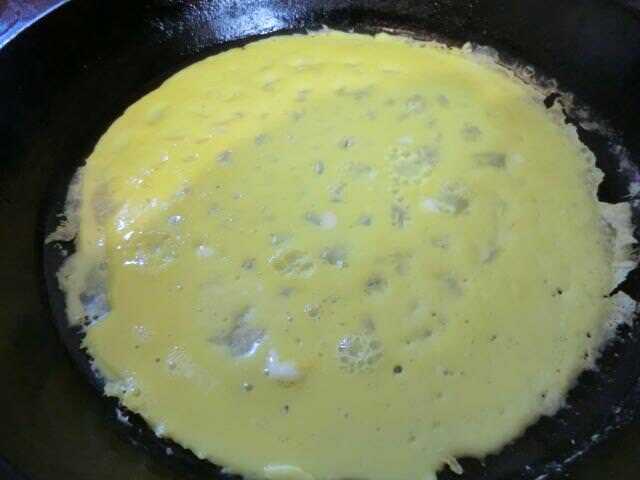 Add about 1/4 cup of the egg mixture and swirl to evenly cover the surface of the frying pan. When the edges of the omelette are dry and start to curl just a bit and the surface of the omelette is still a bit shiny, free the edges and flip the omelette out onto a large plate. 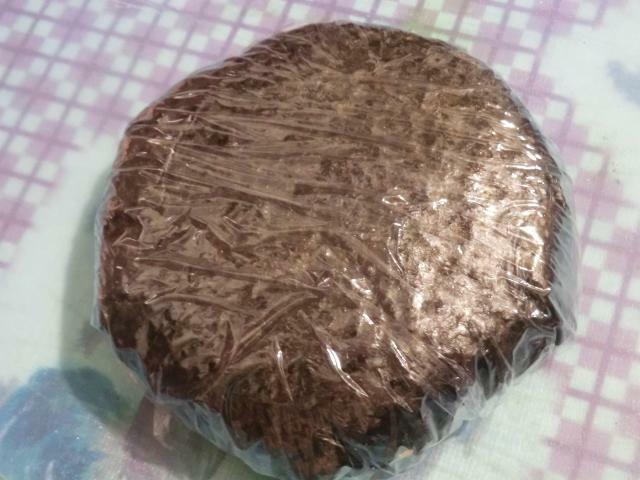 Swipe the frying pan surface with the oiled paper towel and repeat until you’ve used up all the egg mixture. NOTE: Your pan may gradually get hotter so watch that the bottom of the omelette doesn’t brown for a professional omelette quality. Remove the pan from the heat briefly to cool it down if you’re making a lot of omelettes at a time. If you don’t care that the omelette gets a bit brown, it won’t BURN, don’t stress. 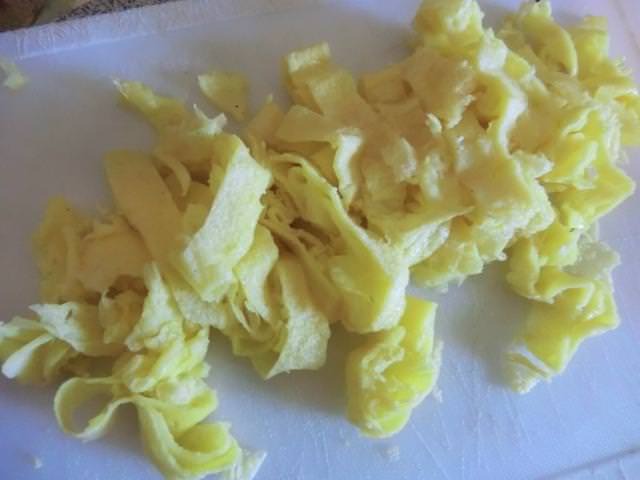 Expert omelette makers may be able to use only about 3 tbsp per omelette for a truly THIN omelette but, as with crepes, I find that 1/4 cup of the mixture is perfect for my pan and I don’t rip the omelette when removing it from the pan. 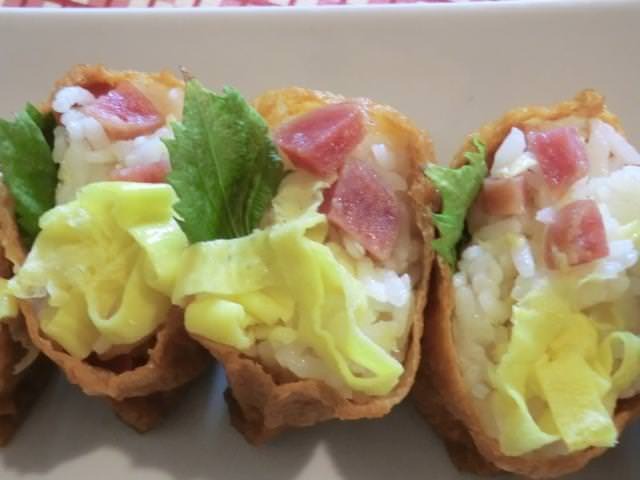 Inari sushi are one of my favourite specialty sushi at the all-you-can-eat sushi restaurants I frequent. If you’re watching your pocket book, however, they’re a snap to make at home with just a few ingredients. 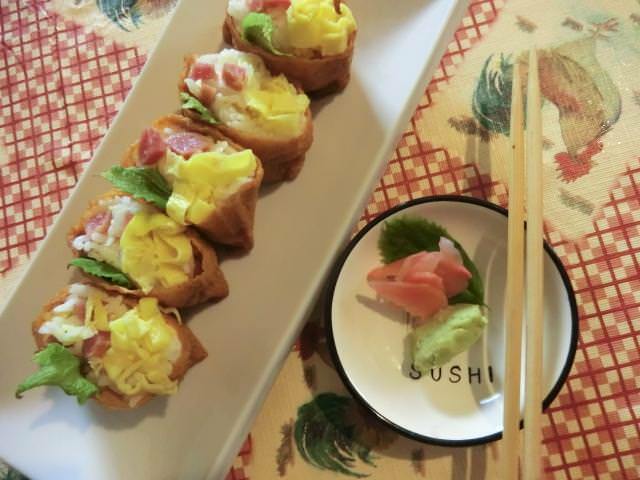 Traditionally filled with cooked and seasoned sushi rice, they may be served plain or topped with egg salad, tuna salad or a variety of other sushi fillings. I’ve also filled the tofu pockets with a somen noodle seafood mixture and with leftover Arborio seasoned Korean style (Yubu Chobap). You can make your own fried and seasoned tofu pockets, but why bother, when you can buy a can of 16 half pockets for a fairly reasonable price (~$5 CDN, locally) and save yourself the mess? 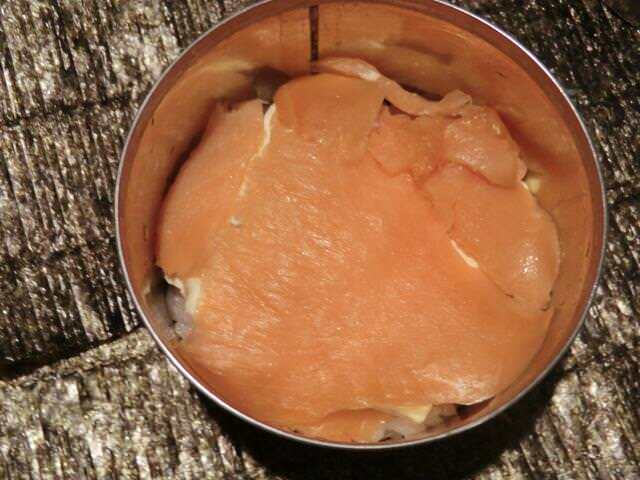 Leftover tofu pockets freeze well in the seasoning liquid once the can has been opened, so they’re practical for single diners. 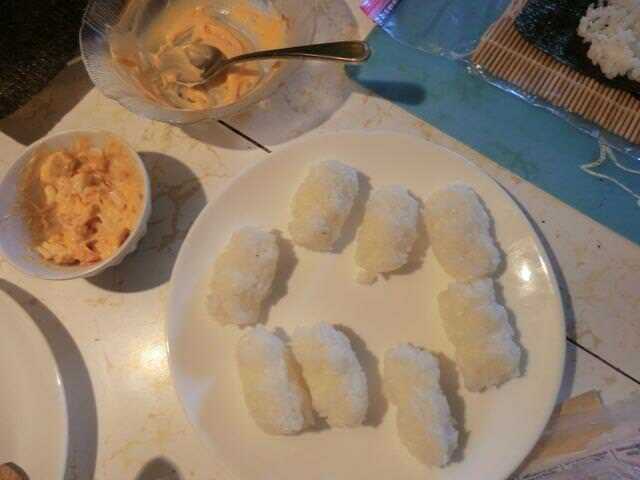 Once cooked, you’ll have about 3 cups of rice, enough to fill 15-16 inari sushi. 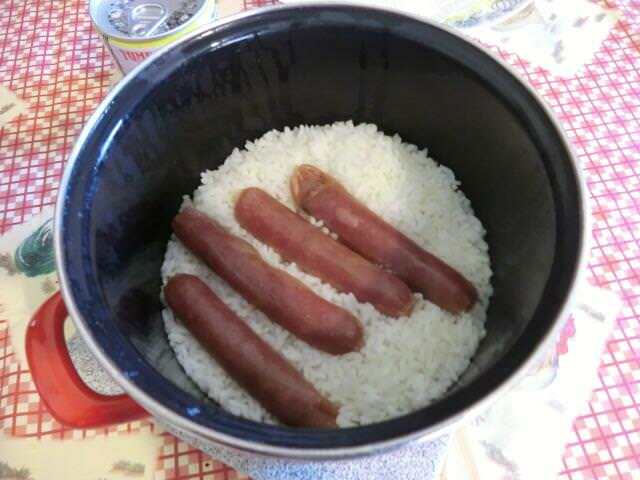 When cooking the sushi rice, lay the sausages over the top of the rice, cook, then remove the sausages and dice. 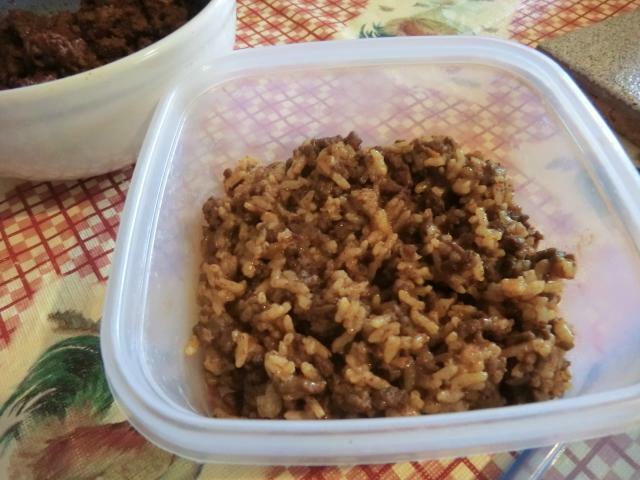 Add the diced sausage to the cooked rice and cut in along with the rice vinegar. 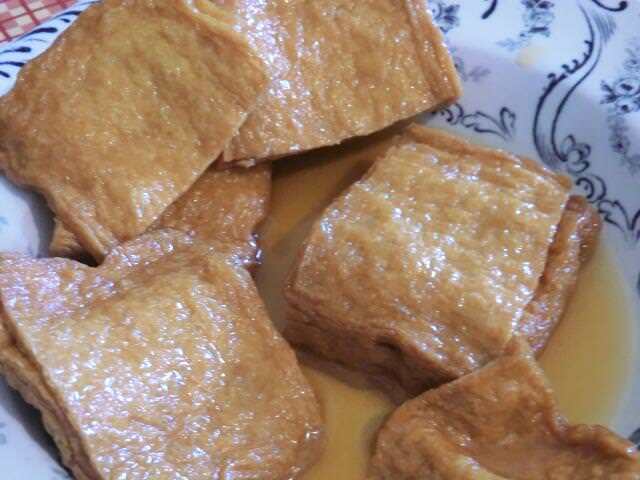 For ease of stuffing the tofu pockets, use 2-3 tablespoons of the rice mixture, shape into an oval and insert it into the opened tofu pocket. 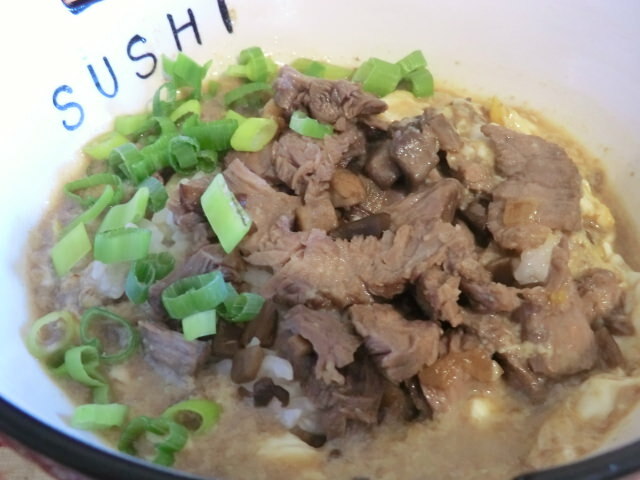 A donburi is a delicious and easy-to-make bowl of sushi rice. 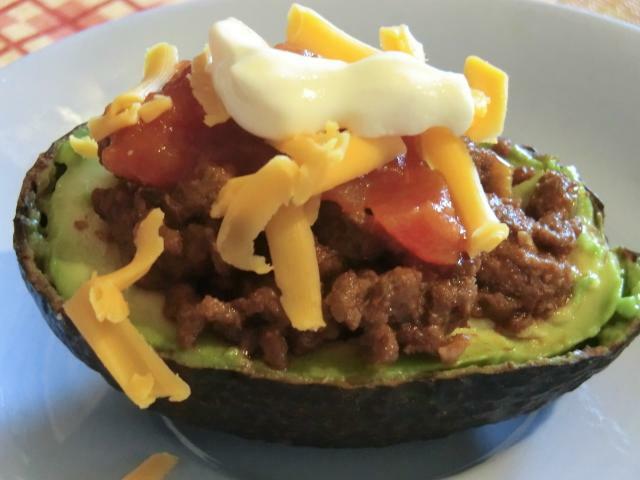 There are a number of variations depending on the toppings. 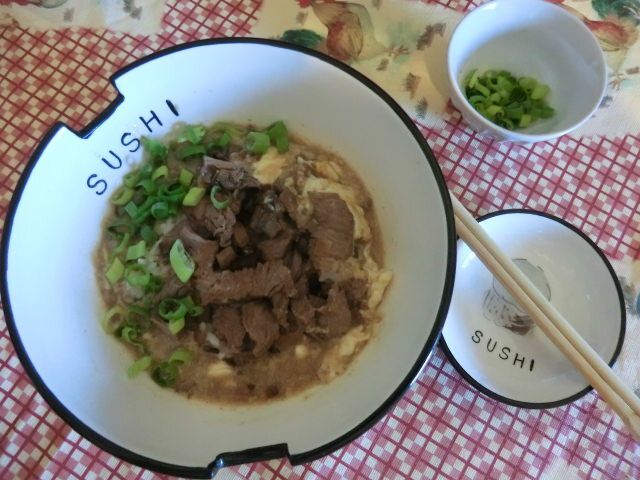 I haven’t had the the beef version or ‘gyudon’ before but I had some leftover steak from my ‘shooter’s sandwich’ so I threw this together. 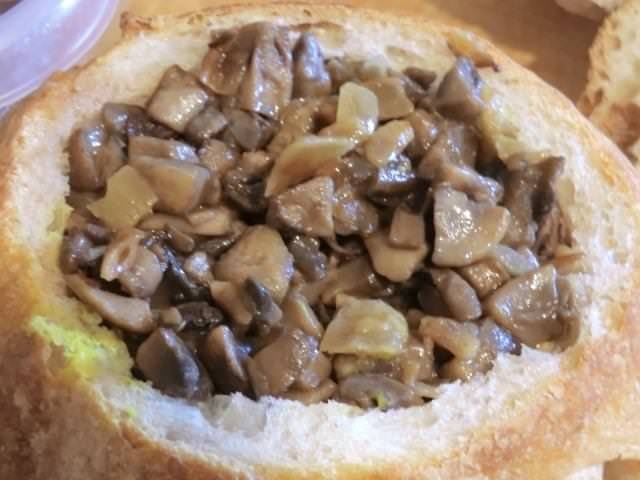 ** In the absence of the onion/mushroom mixture, half and thinly slice 1/3-1/2 medium onion and poach in the simmering sauce until soft before adding the sliced steak to warm through. Simmer together in a small pan or wok. 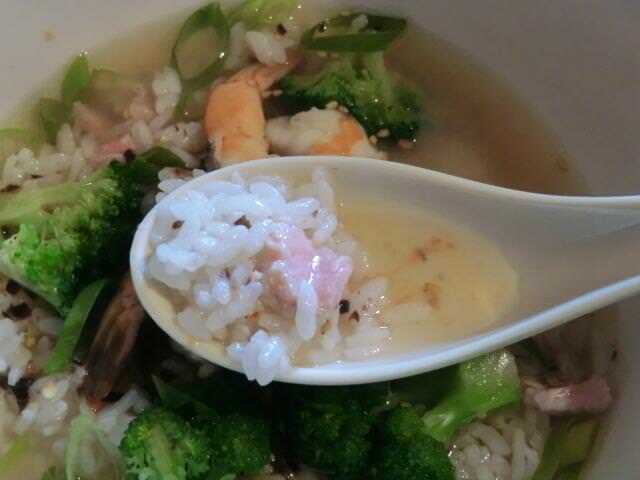 Add the hot cooked rice to a deep bowl. To the pan of simmering sauce, add the steak and onion/mushroom mixture and stir through just long enough to warm the steak through. With a slotted spoon, transfer the steak and onion/mushroom mixture to the top of the hot rice, leaving behind the majority of the simmering sauce. 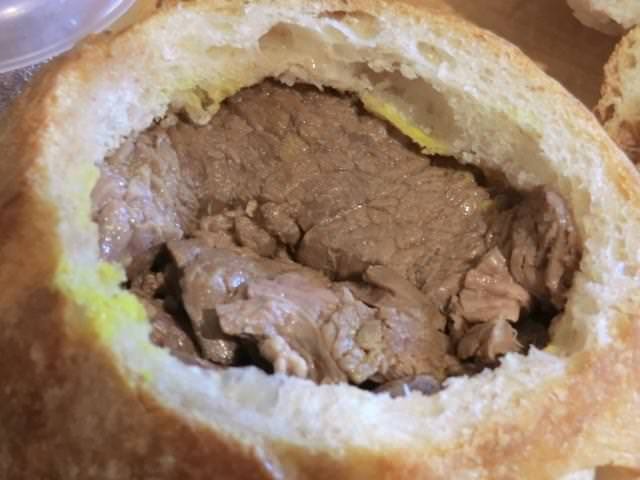 You may poach the egg in the sauce, place it on top of the steak in the bowl and then spoon the sauce around the periphery of the bowl. Scatter the green onion and/or sesame seed garnish on top. Serve. 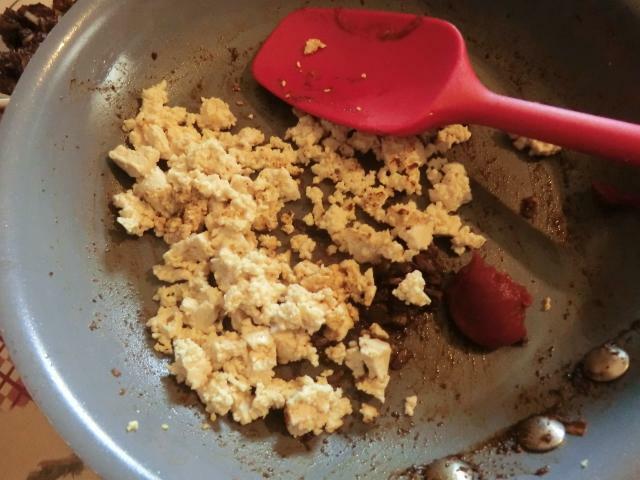 An alternative to poaching the egg is to lightly scramble it in a small bowl, and then add it to the simmering sauce in the wok. Stir the egg through the sauce just long enough to cook/poach the egg and then spoon the egg and the sauce around the periphery of the bowl. Garnish and serve. 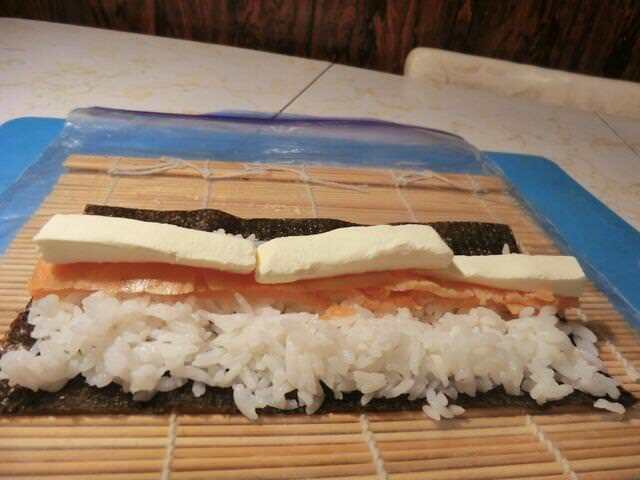 Eating out at one of the local sushi restaurants is a great treat, but, when I’m strapped for cash, I make my own. 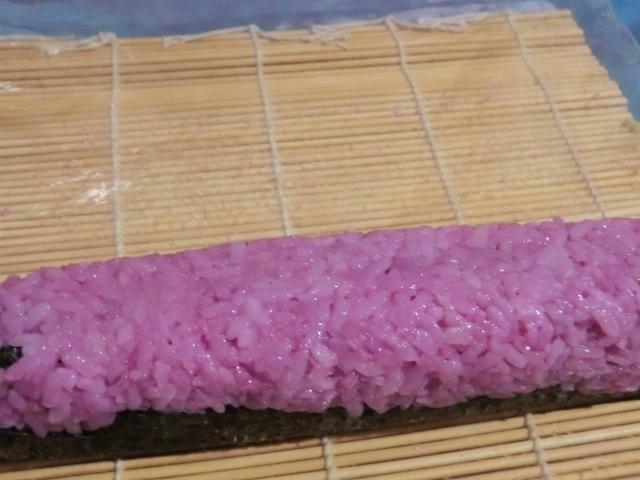 There are many rolled and shaped types of sushi but this version is one of the easiest to make and requires no special equipment or rolling skills. 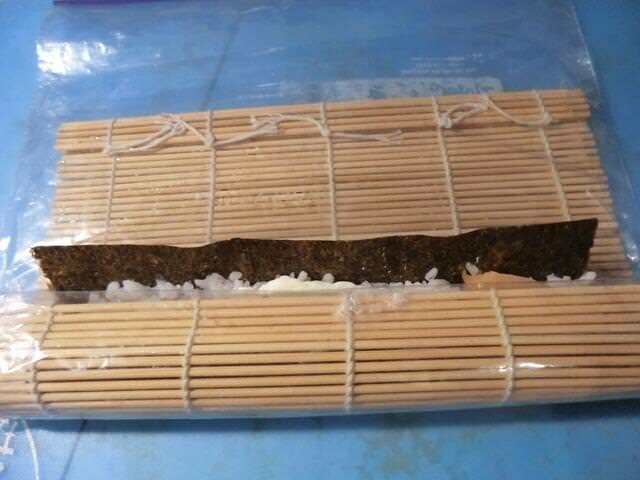 And nori (seaweed) is not needed. 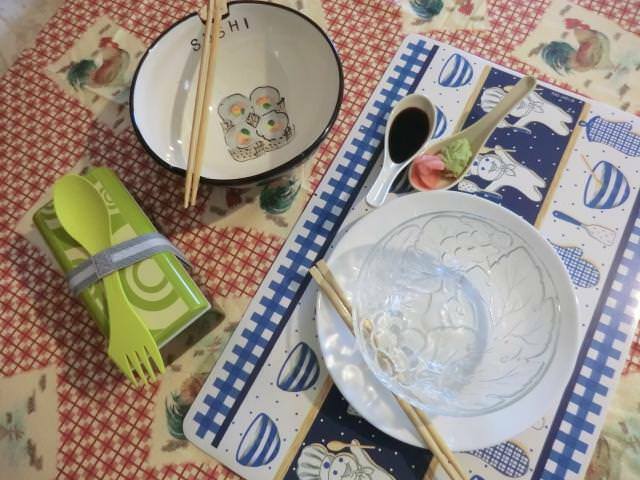 You can serve/assemble this dish in whatever container you’ve got … a special sushi bowl, a bento box or just a pretty bowl that’s large enough to hold your rice and toppings. 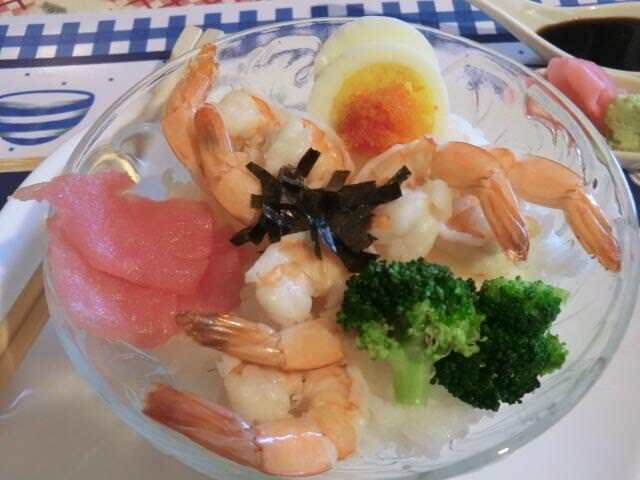 Chirashi or “scattered” sushi starts with a bowl of sushi (seasoned) rice and is topped with an assortment of ingredients. 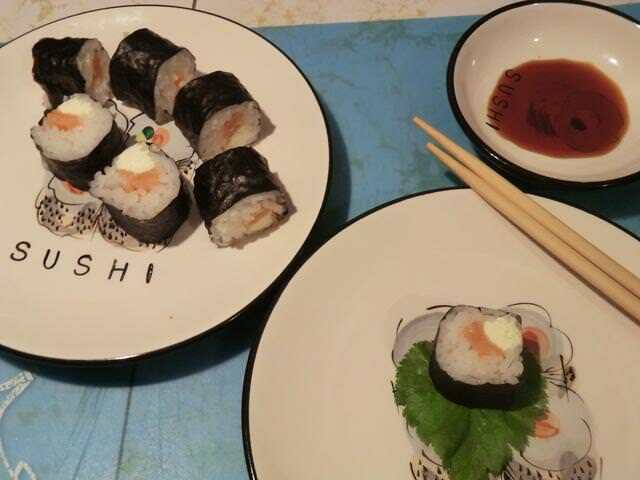 Of course, you may use raw fish (dip in soy sauce before eating) or other items traditionally found in sushi rolls. 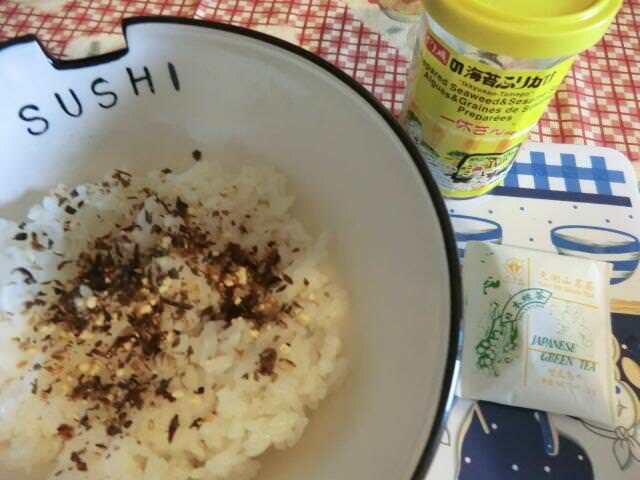 Cook according to package directions and then season with two to three tablespoons of seasoned rice vinegar. 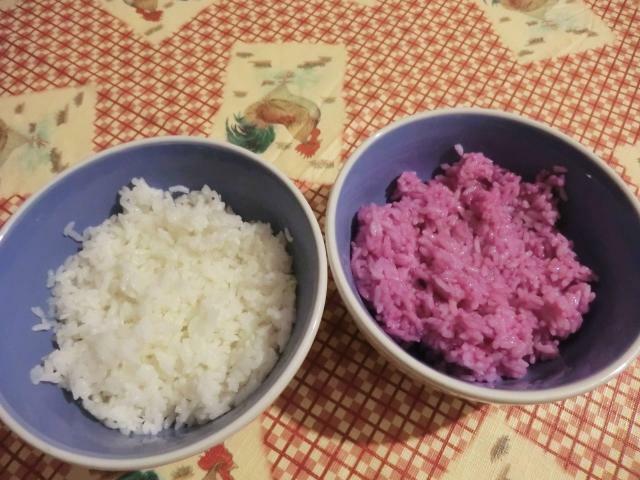 Each cup of raw sushi rice will give you three cups of cooked sushi rice. 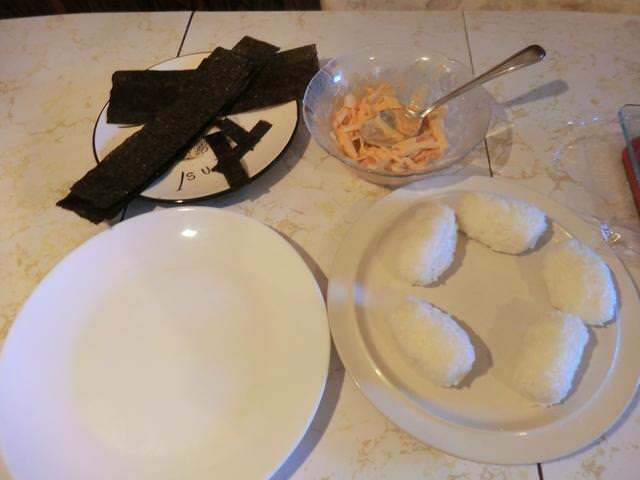 I decided to cut back on the rice serving size, to one cup (instead of 1 1/2), so that I could make three different sushi dishes. 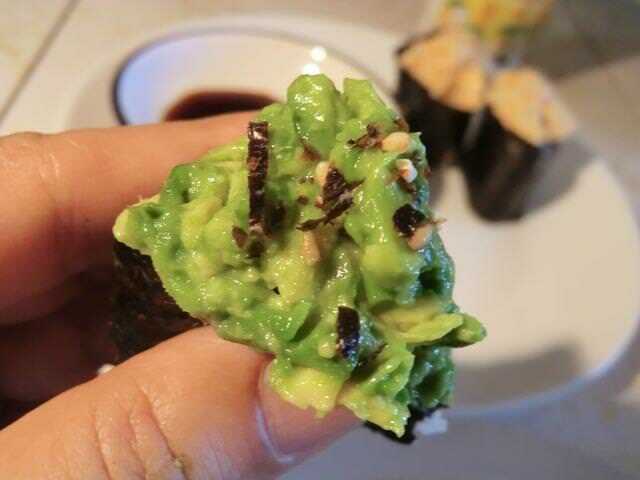 If you can find wasabi powder, make it fresh ( 1 1/2 heaping teaspoon of wasabi powder with 1 tsp of cold water stirred in) for each sushi meal as the heat lessens as it stands. 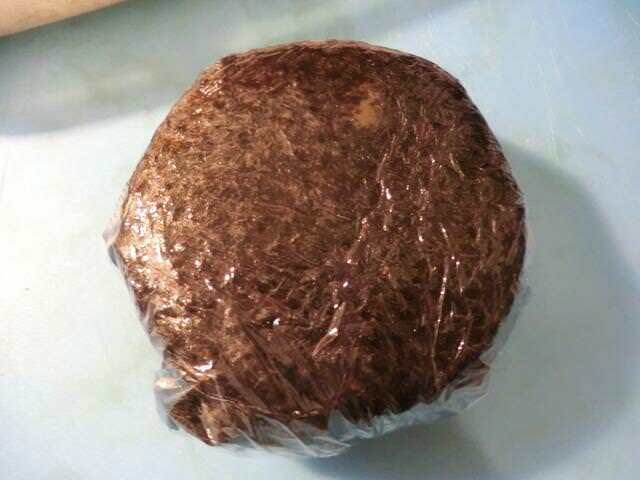 Store the powder in the freezer to keep it fresh. 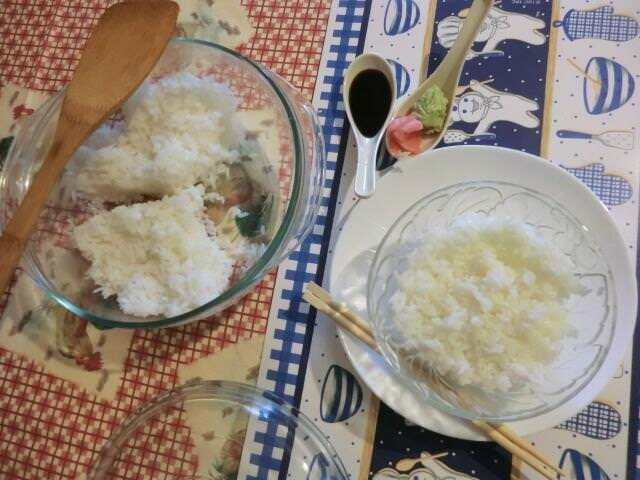 Ochazuke or “rice with green tea” is a great way of using up leftover cooked sushi rice, odds and ends from making sushi rolls, grilled fish and blanched fresh or pickled vegetables. 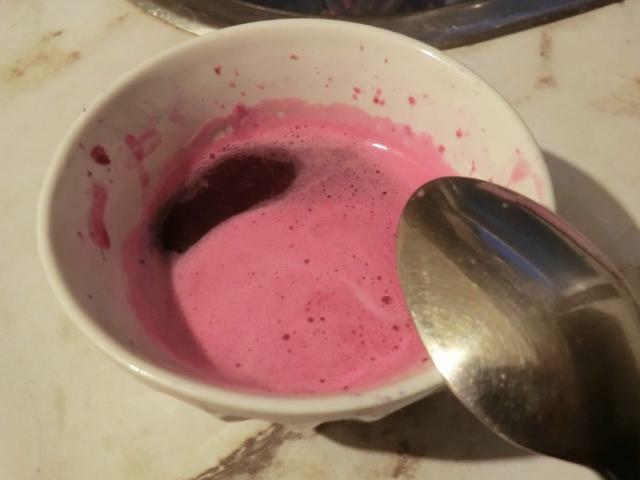 If you stir your raw fish into the hot tea, it will poach quickly. 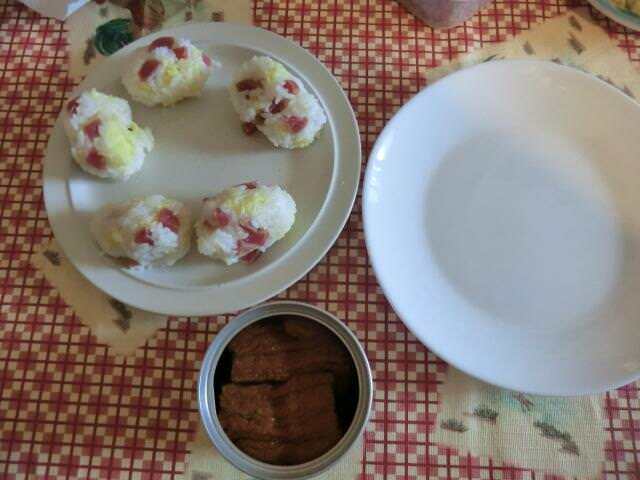 And with my third cup of sushi rice and the last of the raw ahi tuna I had thawed, I made these two traditional sushi rolls. 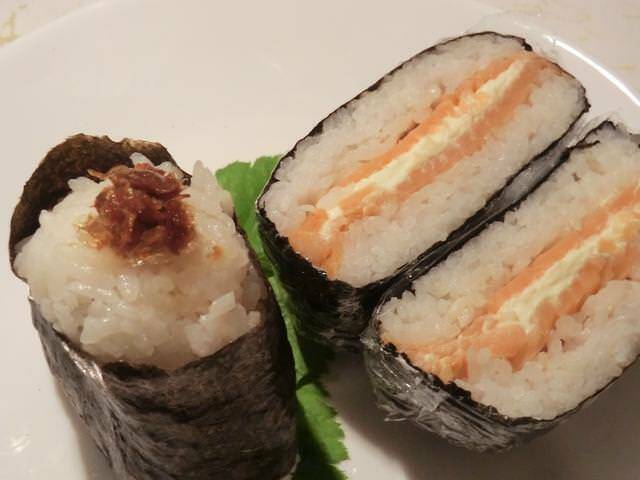 The spicy tuna roll was topped with masago (capelin roe) while the other roll just had strips of the tuna and avocado so that the flavour of the tuna could be appreciated ‘naked’. 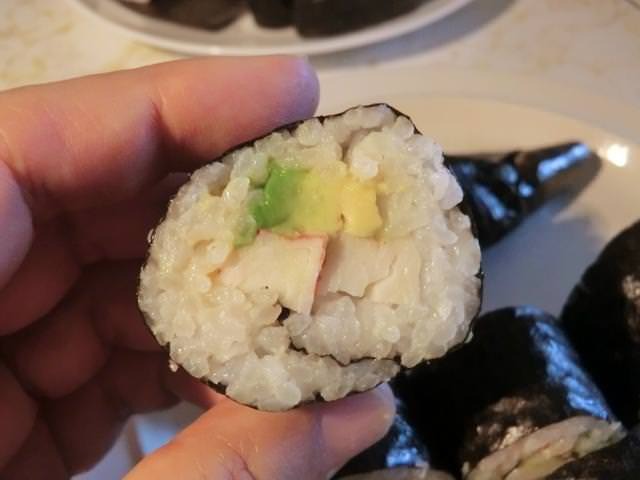 No sushi grade fish/seafood? No smoked salmon? No asparagus? 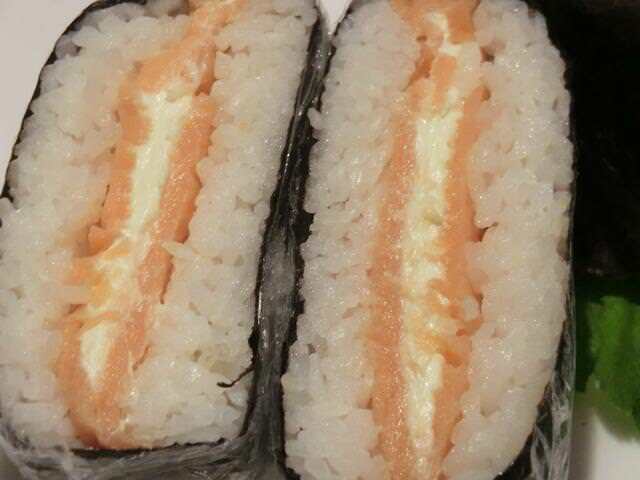 Don’t want to make tamago? The bacon’s frozen solid? Well, what DO you have? 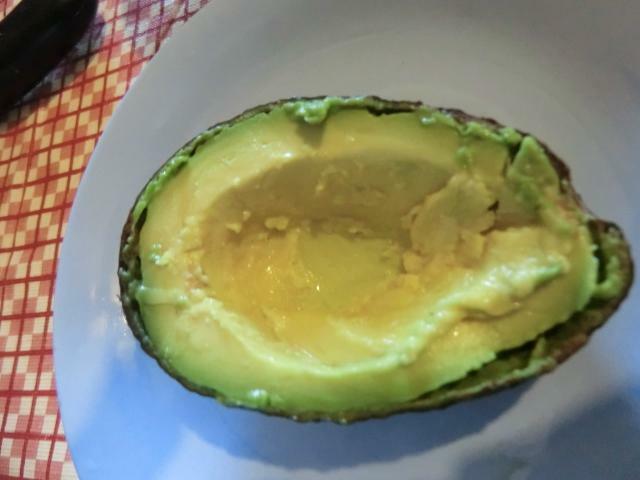 A couple of avocados in the fridge and three fake crab sticks in the freezer. Ok …. I CAN do this. This is the internal conversation I had with myself. Luckily, the crab sticks thawed quickly when I submerged the plastic freezer bag in cold water. 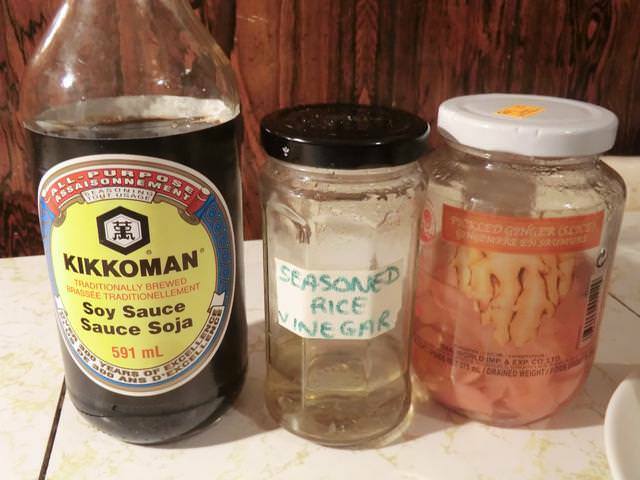 I had to make a quick batch of seasoned rice vinegar (6 tbsp rice vinegar, 2 tbsp sugar, 2 tsp salt) cause I was almost out but otherwise, this is what I ended up with. 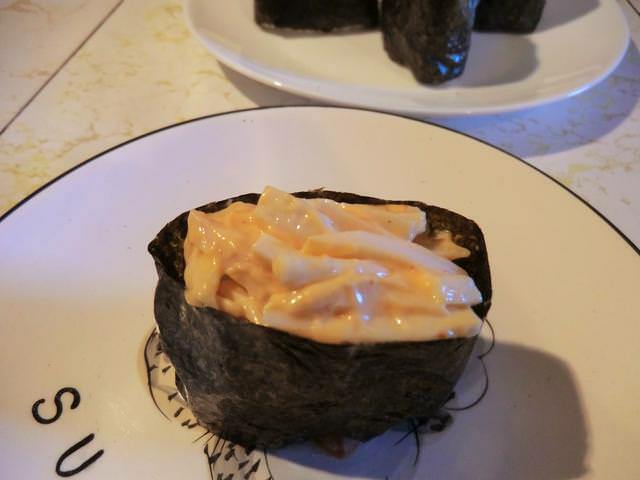 Repurposing leftover Sriracha and wasabi mayonnaise can be a challenge, but the results are sometimes pretty amazing. 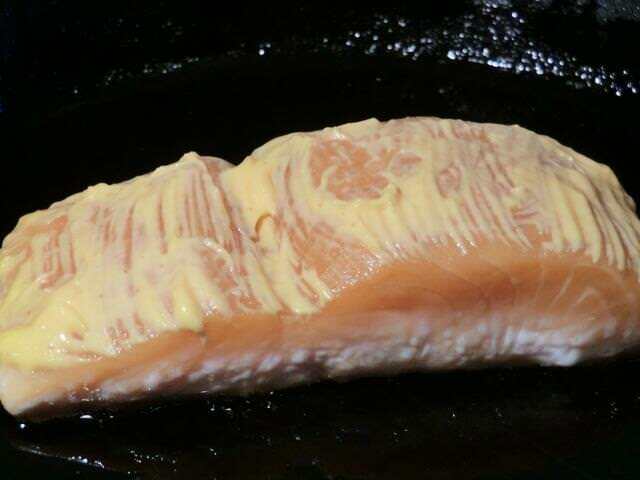 Sriracha Mayonnaise – Salmon fillet brushed with mayonnaise, pan-seared in a hot cast iron frying pan on the stove for 3-4 minutes, and then finished in a 425 deg F oven. 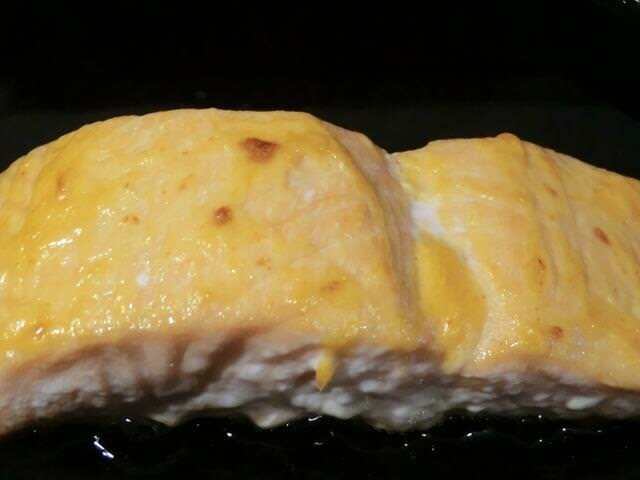 A brief (1-2 minutes) time under the broiler will give the top a perfect finish. 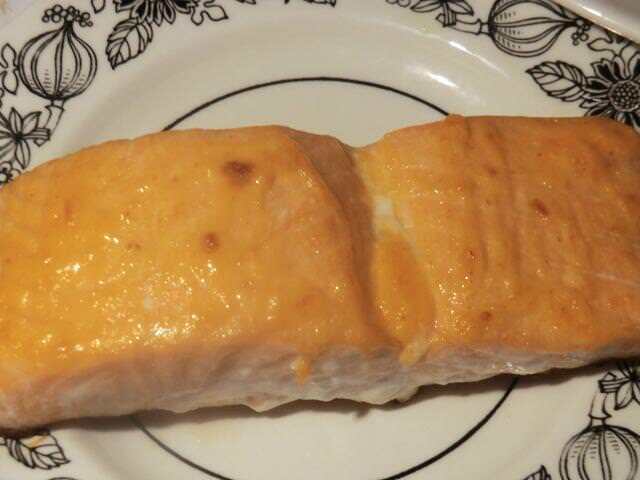 Serve the salmon with your favourite rice dish and a green salad. Preheat oven to 425 deg Fahrenheit. 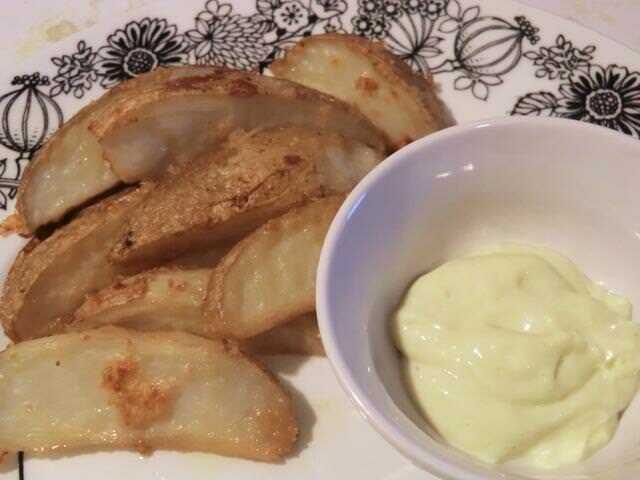 In a large bowl, toss the potato wedges with the rest of the ingredients. 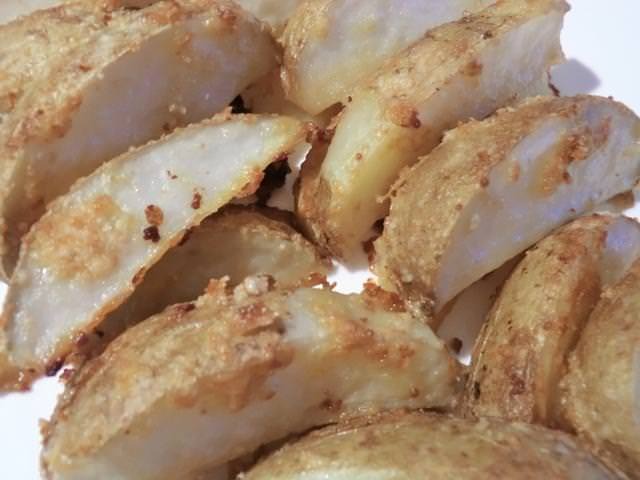 Spread the coated potatoes out in a single layer on a parchment lined baking sheet and bake for 30-40 min, or until the potatoes are tender. 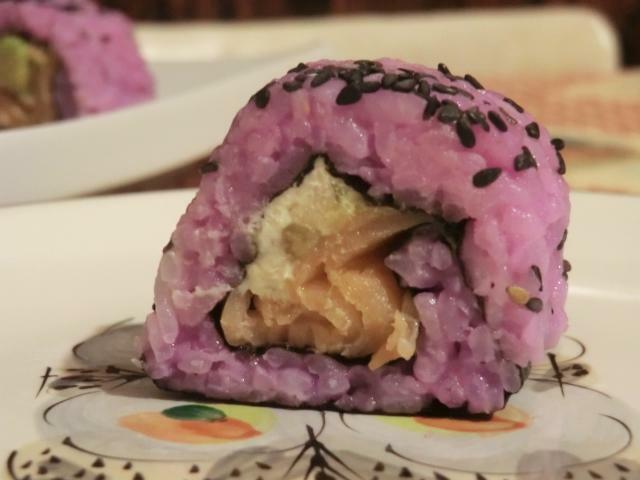 Making sushi at home is easier than many imagine. 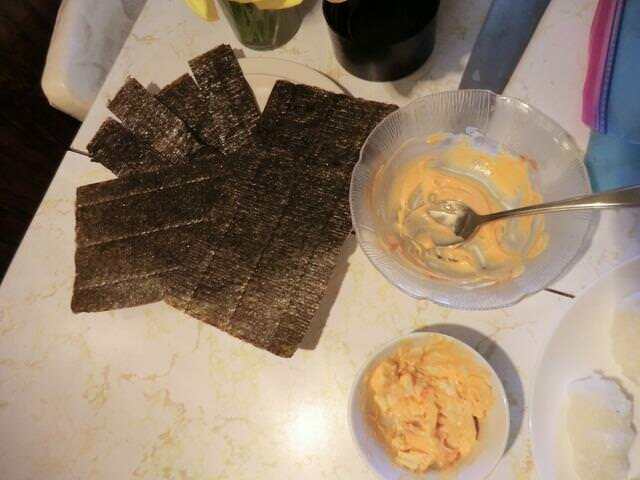 There are a few basic ingredients: short grain sushi rice, rice vinegar, sugar, salt, toasted nori sheets (full or half size). 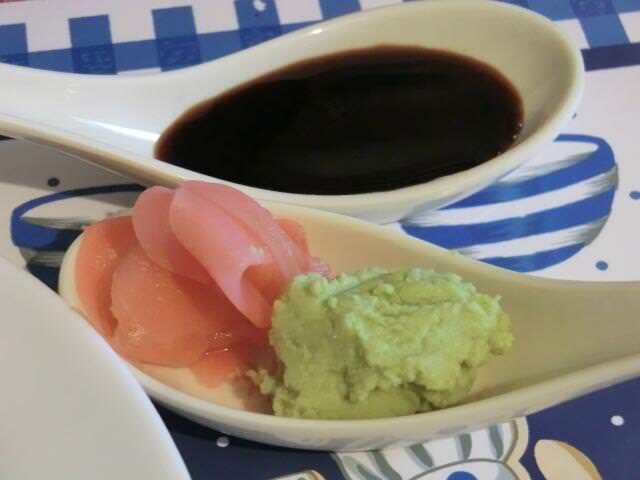 Fillings vary, of course, but the unsung heroes of sushi are the condiments like soy sauce, pickled ginger and wasabi. 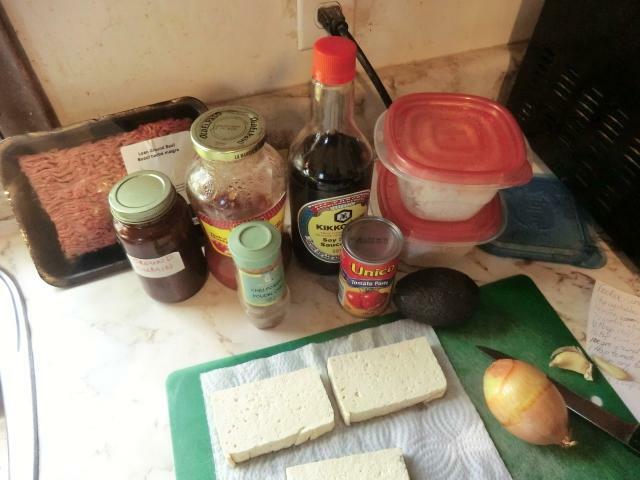 And sauces … to include in your roll or to drizzle over the rolls for a garnish. 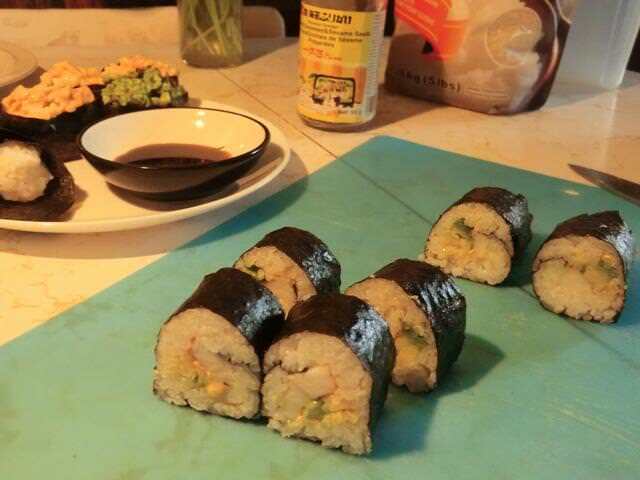 Unless you’re planning on a big party, only make small amounts of the sauce shortly before making your sushi rolls. 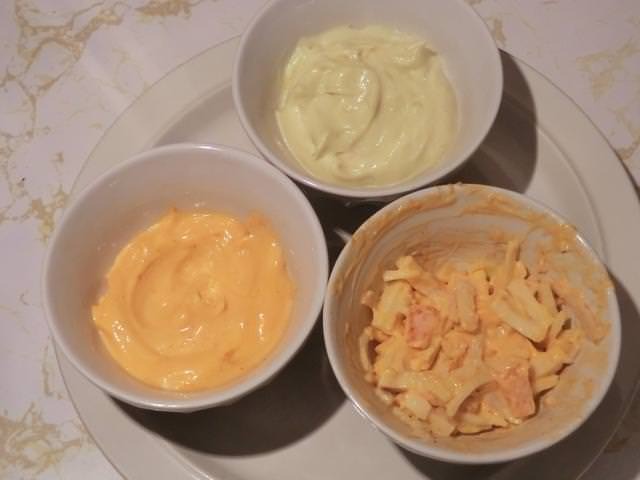 Basic Mayo Sauce Recipe – 1/4 cup home made or commercial mayo (or Miracle Whip) and 1/2 tsp Sriracha or a rounded 1/2 tsp of wasabi powder. 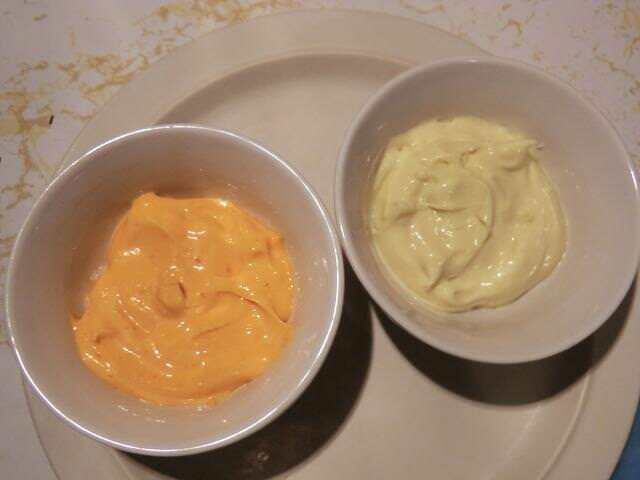 Stir into the mayo and taste. Add more of the add in, or the mayo depending on your preference. 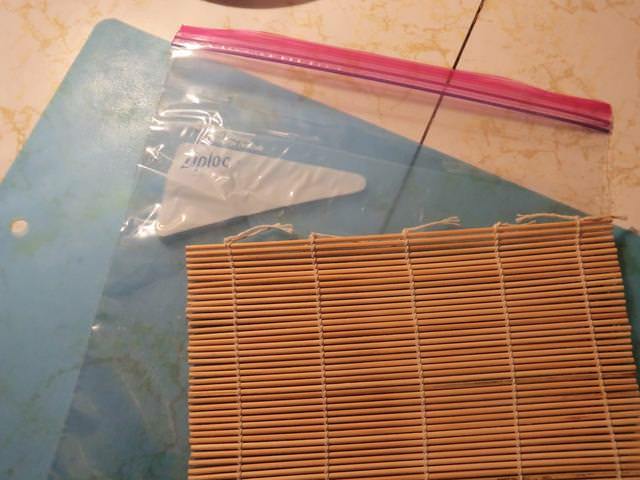 Getting ready to make the sushi rolls: sharp knife, working/cutting surface, rolling mat and a freezer bag to wrap the mat in so it stays clean. 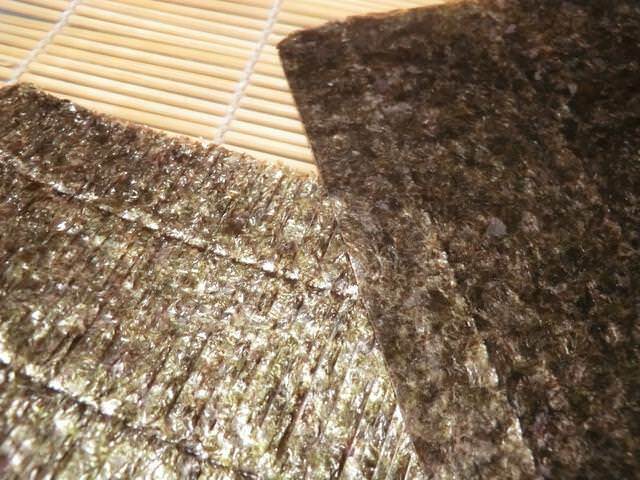 Nori … nori sheets have a smooth/shiny side and a rough side (left of the picture). 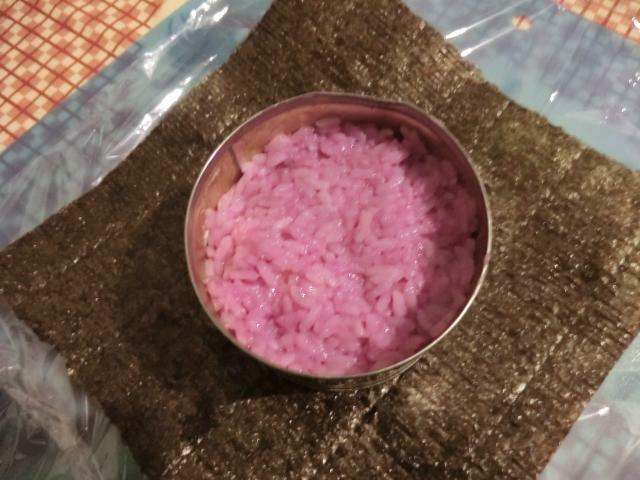 The rice is placed on the rough side. 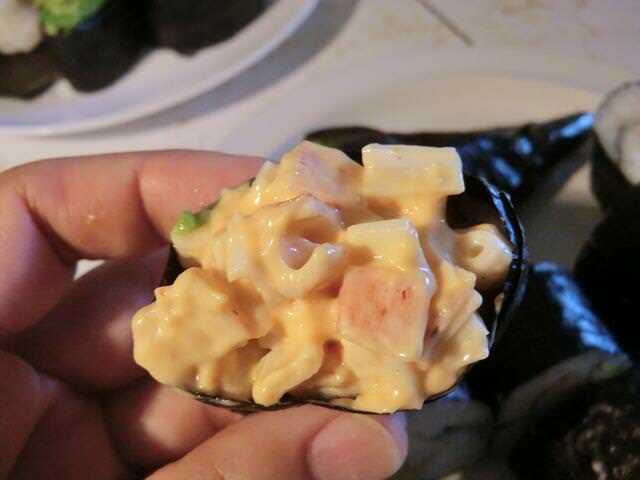 Along with making the more commonly known maki sushi rolls, I made something called “gunkan” or battleship sushi. 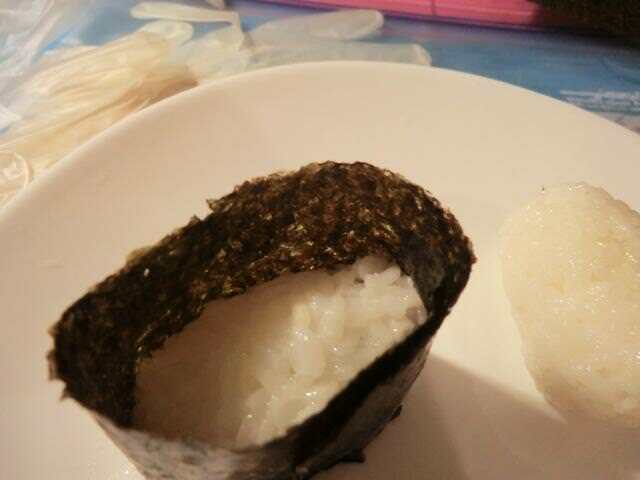 2-3 tbsp (~40 gm) cooked rice per rice ball, shaped into a 1 1/2-2 inch oval. 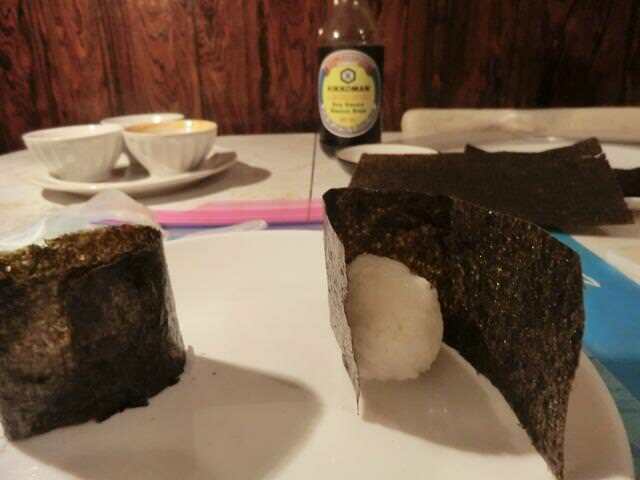 Wrap the strip of nori around the rice ball. 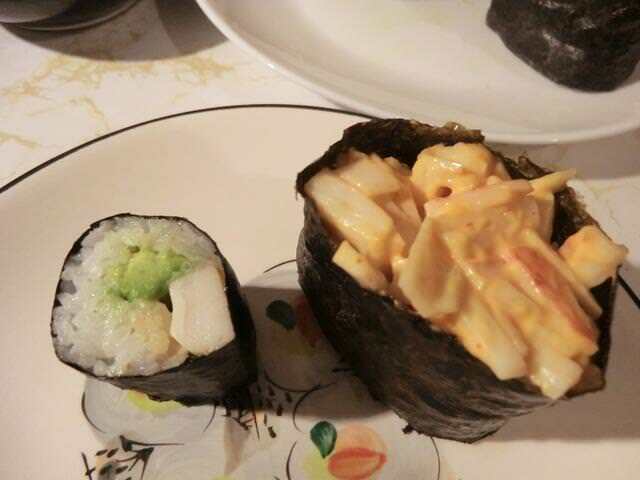 Top with about a tablespoon of desired filling … like the spicy Sriracha shredded ‘crab stick’ below. My favourite starch sides are potatoes, pasta and rice … in that order. 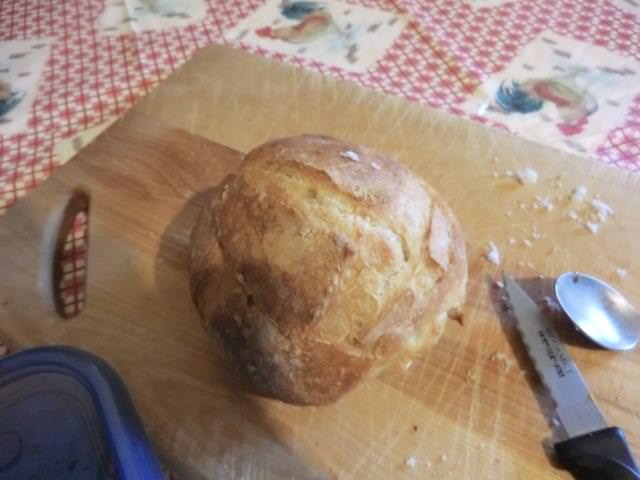 Since I haven’t had any potatoes in the house for almost two weeks, I’ve been relying more on the other two in my cooking. 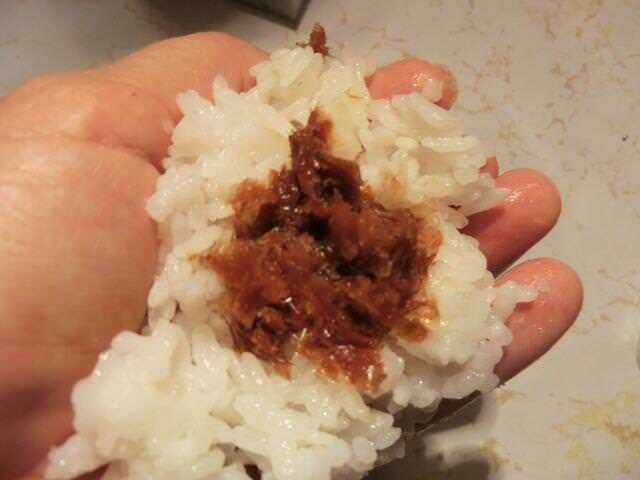 Especially rice. Whether long, medium or short grain, rice is quick to prepare and a fitting neutral base for many flavours and add-ins. 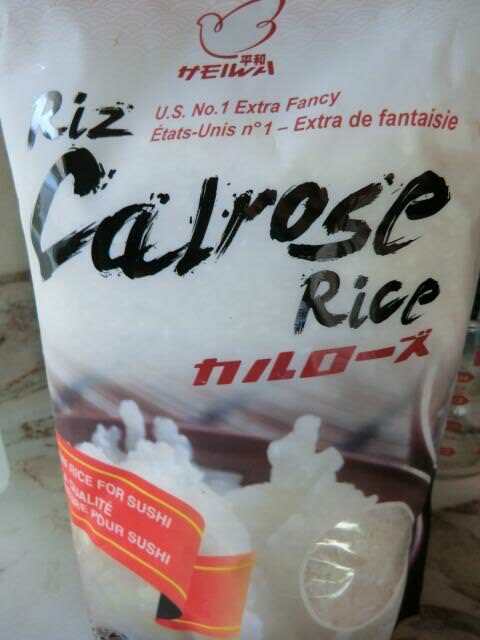 Sticky, short grain rice brands, like the Nishiki ($2.20 / lb), Calrose and Kokuho Rose varieties, available locally, are something I’ve only been eating for about five years, mostly in sushi dishes, though you can make a great sweet rice pudding with them too. 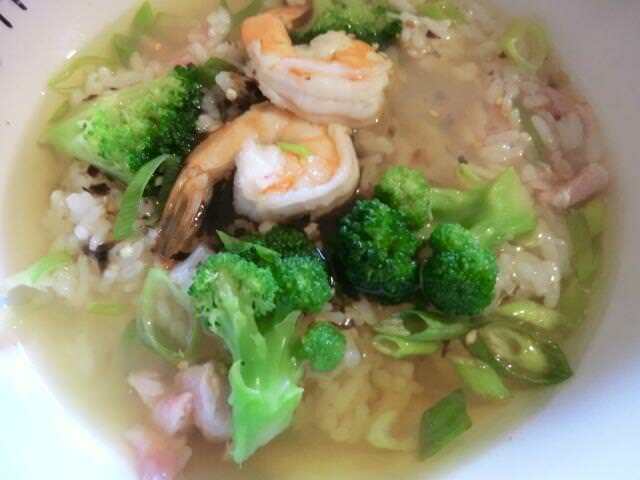 And risotto, usually made with Arborio and Carnaroli, can also be made with ‘sushi’ rice brands. 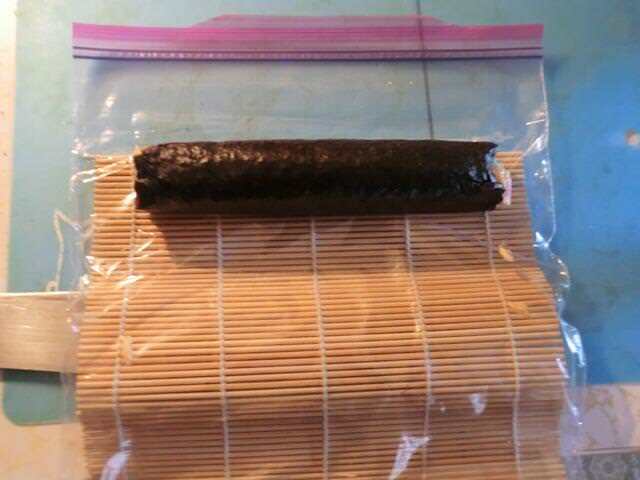 To switch things up, I decided to make “onigirazu”, a type of sushi rice sandwich wrapped in a full sheet of nori. 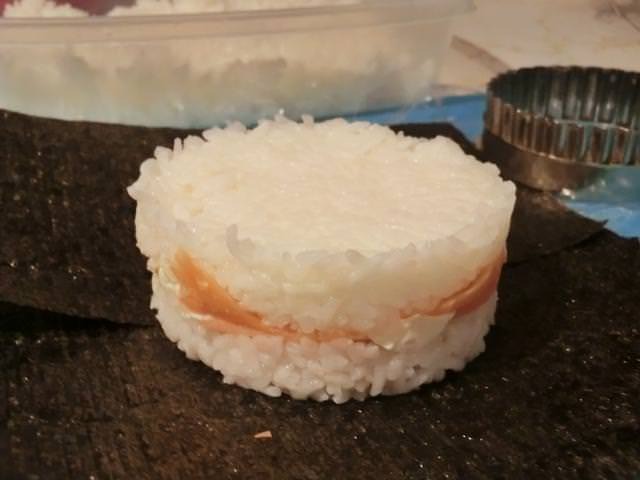 Like the rice balls, “onigiri”, I posted a while ago, this is a portable sushi food item often found in bento boxes. 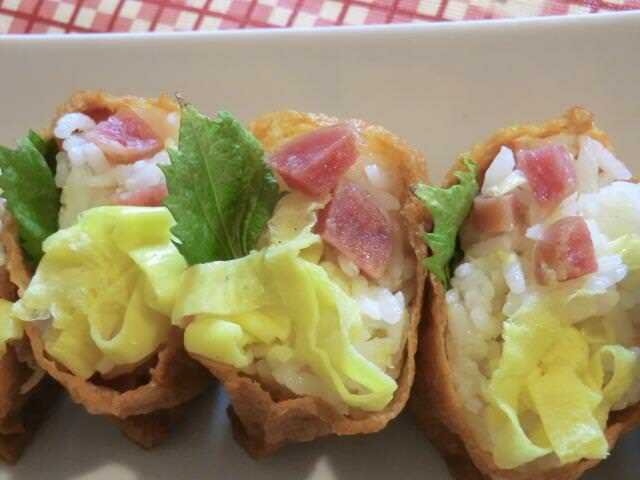 Depending on the fillings, the onigirazu may be served cold, room temperature or warmed slightly. 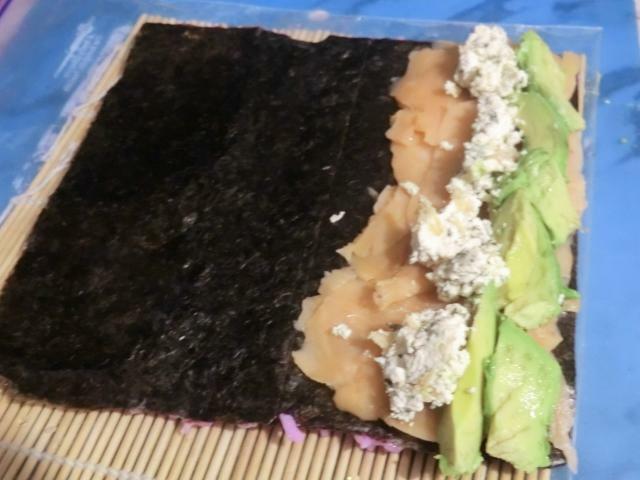 I’ve been putting off making this dish because I made the mistake of buying a package of (400) half sheets of nori, a while ago, and am too ‘frugal’ to buy more before I use them up. 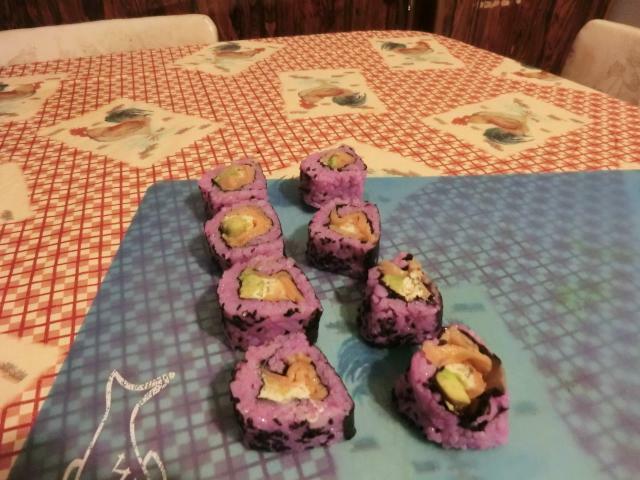 However, I’ve made thicker sushi rolls using two overlapping nori half sheets, so I thought I’d use that technique and attempt this dish. 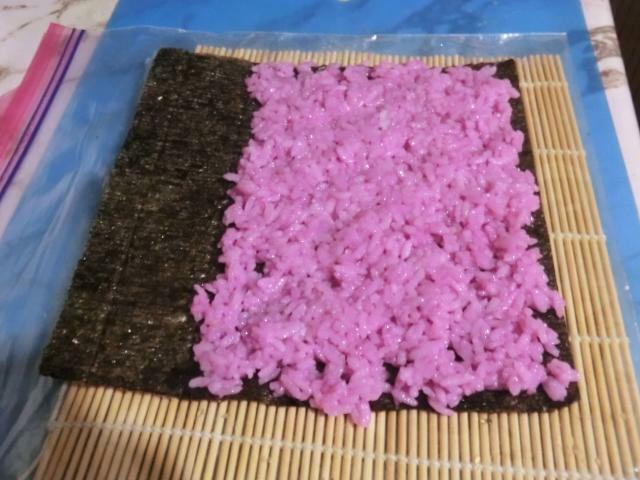 Another variation/adaptation of the regular onigirazu is that instead of making a square block of rice on top of the nori sheet, placing the fillings on top, then covering it with the same amount of rice, shaping that into a square block and wapping the whole with the nori sheet, I used a mold into which the sushi rice would be placed etc. 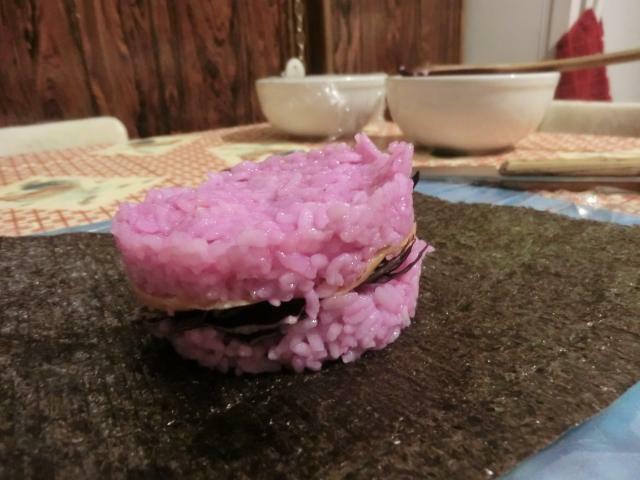 This is similar to the technique I used to make the Spam “musubi” some time ago. 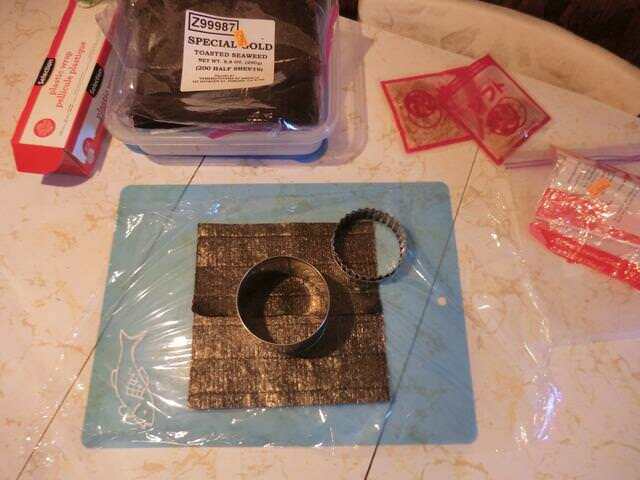 Since I didn’t have a square mold, I thought I’d use a short tin can with the top and bottom removed. 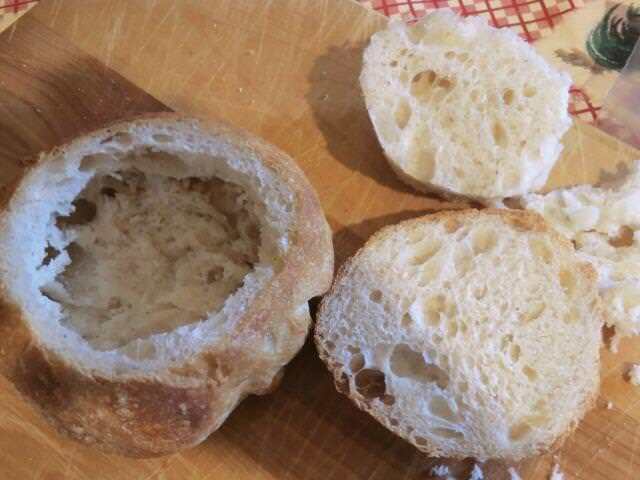 An English muffin ring may be used if you have one. 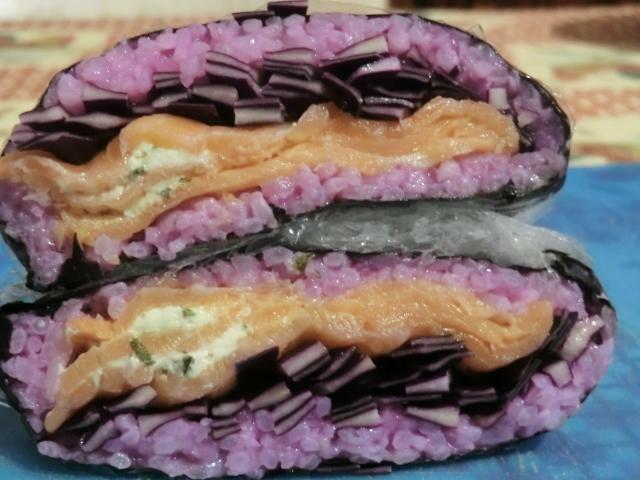 A TOTAL of about 1/3-1/2 cup of rice is divided between the top and the bottom of the ‘sushi rice sandwich’. 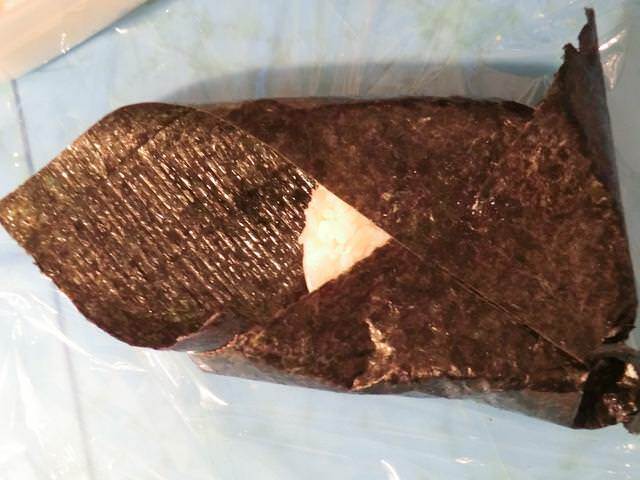 A few pictures of how to assemble the onigirazu … start with a sheet of food wrap over your assembly area then lay down your sheet of nori and center your mold on the sheet. 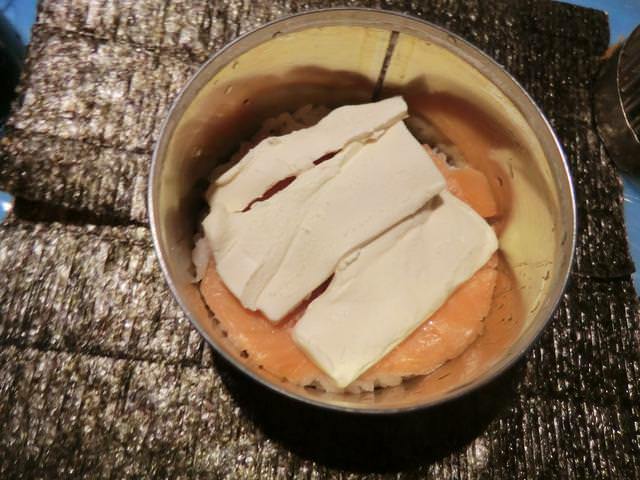 I really like smoked salmon so I went with two layers. 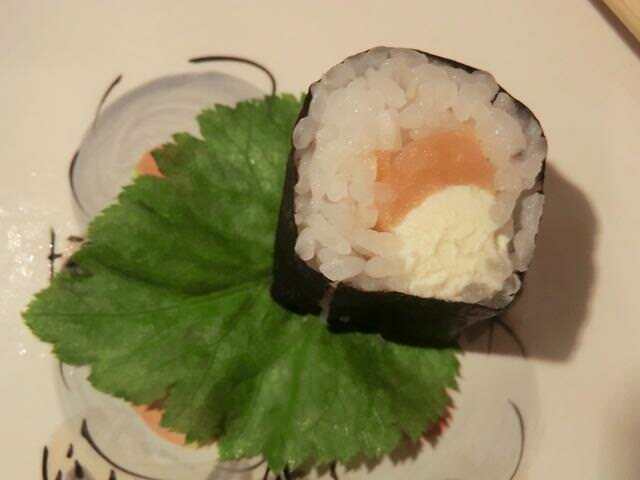 Philadelphia Roll – there are several versions of this roll but they all include smoked salmon and cream cheese. 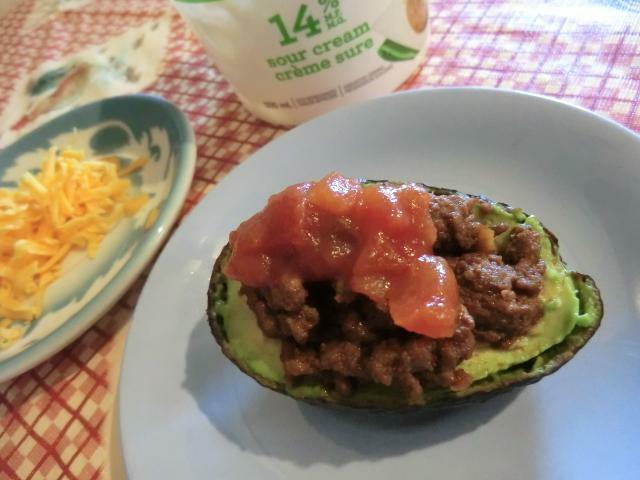 Other ingredients include sliced avocado or julienned cucumber. 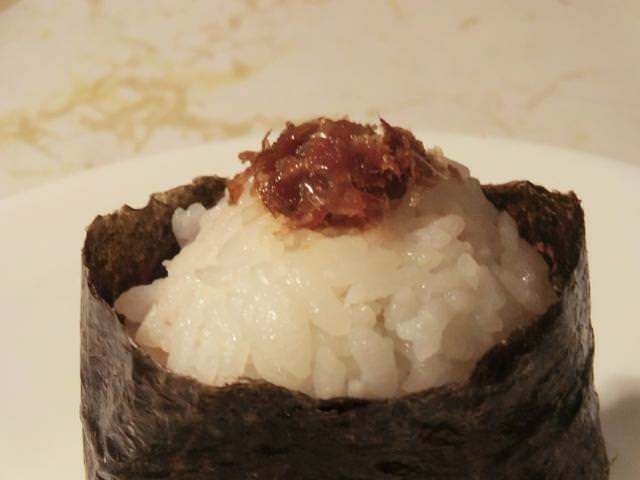 Okaka (dried bonito flakes moistened with soy sauce) Onigiri – ingredients needed for this include about a cup of cooked sushi rice, 2 tbsp of bonito flakes, enough soy sauce to moisten, a 1-1 1/4 inch strip of nori and a large pinch of salt to flavour the rice. 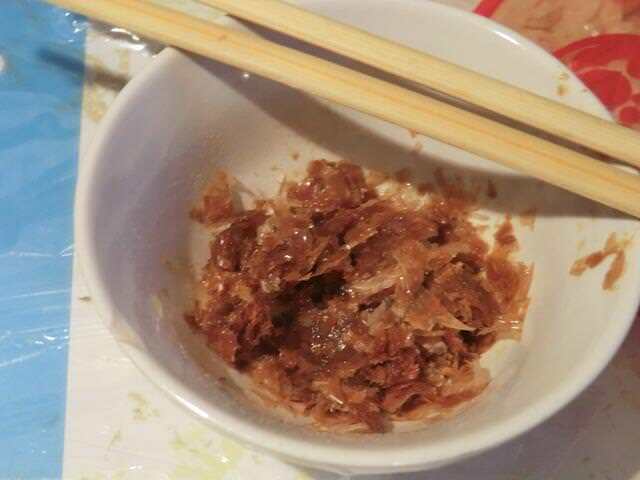 Add the soy sauce a few drops at a time to your bonito flakes and stir them in, repeating, until most of the flakes are moistened. 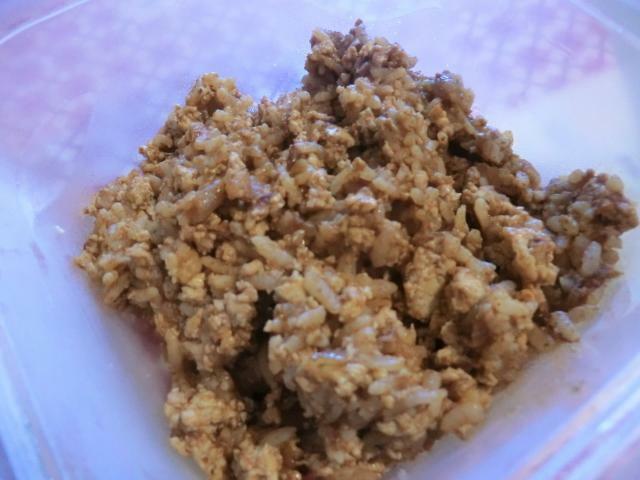 … as found on various web sites especially “Just One Cookbook”. 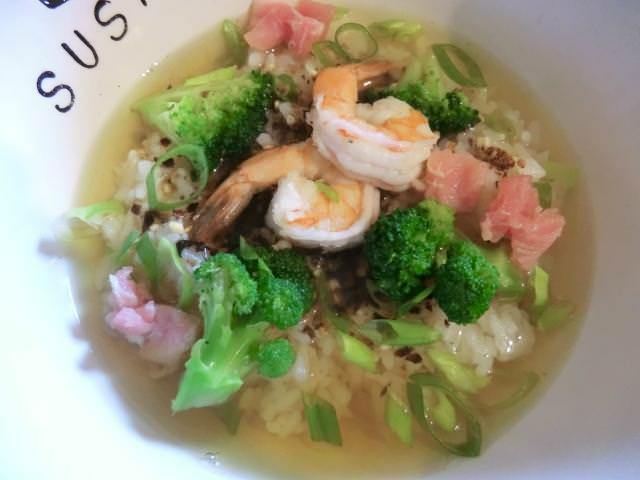 Nami makes her many Japanese recipes accessible to the western home cook and her website is a valuable resource for new ideas and adaptations of classic dishes.